The title doll from New Line Cinema and Warner Bros. Pictures’ horror thriller, ‘Annabelle Comes Home,’ which was written and directed by Gary Dauberman, and stars Patrick Wilson and Vera Farmiga. 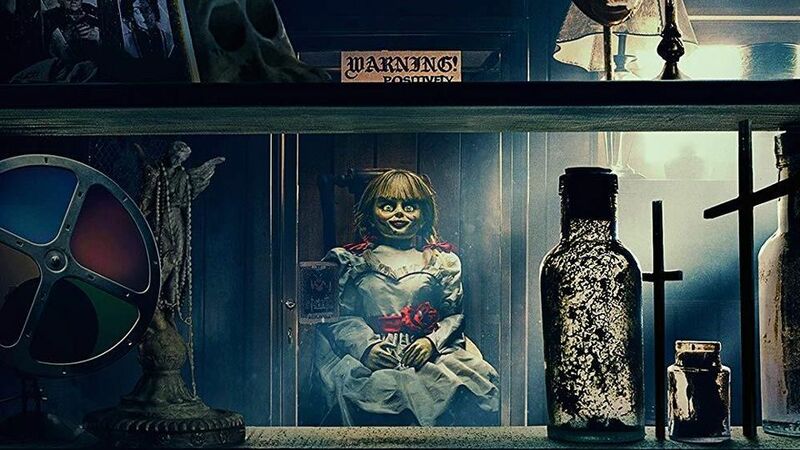 The anticipated horror movie is the second sequel in New Line Cinema’s hugely successful ‘Annabelle‘ series, which features the infamous sinister doll from the ‘Conjuring’ universe. Gary Dauberman, the screenwriter of the previous two ‘Annabelle’ films, including 2014’s ‘Annabelle’ and 2017’s ‘Annabelle: Creation,’ as well as last year’s ‘The Nun,’ made his directorial debut on ‘Annabelle Comes Home,’ which was produced by ‘Conjuring’ universe creator, James Wan. ‘Annabelle Comes Home‘ stars McKenna Grace (‘The Haunting of Hill House,’ ‘Gifted,’ ‘Captain Marvel‘) as Judy; Madison Iseman (‘Jumanji: Welcome to the Jungle,’ ‘Goosebumps 2: Haunted Halloween’) as her babysitter, Mary Ellen; and Katie Sarife (‘Youth and Consequences,’ ‘Supernatural’) as her troubled friend Daniela. Patrick Wilson (‘The Conjuring’ and ‘Insidious‘ movies) and Vera Farmiga (‘The Conjuring’ films, upcoming ‘Godzilla: King of the Monsters,’ TV’s ‘Bates Motel’) reprise their roles as Ed and Lorraine Warren. Determined to keep Annabelle from wreaking more havoc, demonologists Ed and Lorraine Warren bring the possessed doll to the locked artifacts room in their home, placing her safely behind sacred glass and enlisting a priest’s holy blessing. But an unholy night of horror awaits as Annabelle awakens the evil spirits in the room, who all set their sights on a new target—the Warrens’ ten-year-old daughter, Judy, and her friends. For more information on ‘Annabelle Comes Home,’ visit is official website, as well as its Facebook, Instagram and Twitter pages. Warner Bros. Pictures has released the official trailer for the horror thriller sequel, 'Annabelle Comes Home,' which was written and directed by Gary Dauberman, and stars stars Patrick Wilson, Vera Farmiga and Mckenna Grace.